Welcome to Down On The Street, where we admire old vehicles found parked on the streets of the Island That Rust Forgot: Alameda, California. How about another Beetle Day today? As I've mentioned before, Alameda has sufficient air-cooled Beetles parked on the street for me to do a solid couple of Pure Beetle DOTS. I'm not going to do that, but I've owned a few Type 1s and I still like these rackety little machines… which means I'm going to sneak in a DOTS Beetle every so often. Once again, VW's reluctance to mess with Type 1 design means I can't be 100% sure I have the year right on this one (though it's obviously not a Super Beetle). 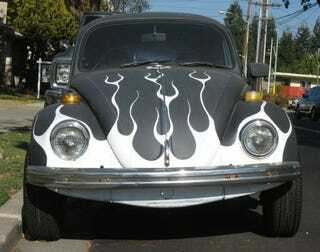 The vents behind the rear side windows means it's a '71 or later, and the taillights and bumpers say it's non-Malaise. I'm pretty sure it's a 1971 or 1972. The Japanese (not to mention the Pinto and the Vega) were starting to squeeze the Beetle in the marketplace by the early 1970s, but the price tag on these cars was still quite appealing for penny-pinchers. In 1971, you'd pay just $1,845 for a new (non-Super) Beetle, which was 74 bucks cheaper than a new Pinto. However, the Pinto's OHC engine made a mighty 100 horsepower, while the Beetle's lawnmower boxer engine wheezed out a mere 60 horses. Tough choice?